Richmond is a place where traditionally life was tough. Janet McCalman’s history of the suburb is aptly titled Struggletown. But in spite of the adversity, people find a way to make it through. Understanding this fact – the way the geography shaped social reality, placing the wealthy in a position to literally look down on their working class neighbours – gives you a hint about the psychology of the place, and why its history and mythology unfolded the way that it did. There were always some, though, who managed to straddle the two worlds. 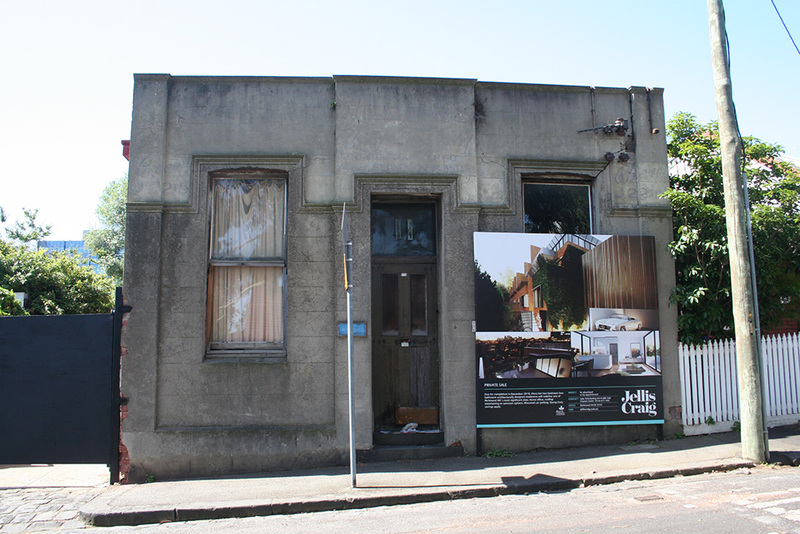 At 11 Goodwood Street, Richmond, stands a curious building I’ve photographed a few times. It was in a state of dilapidation for several years, but now a process of renovation is under way. Running along the top are the vestiges of a name, and you can make out the words ‘Established 1860’ and ‘Also at Sydney Newcastle’. 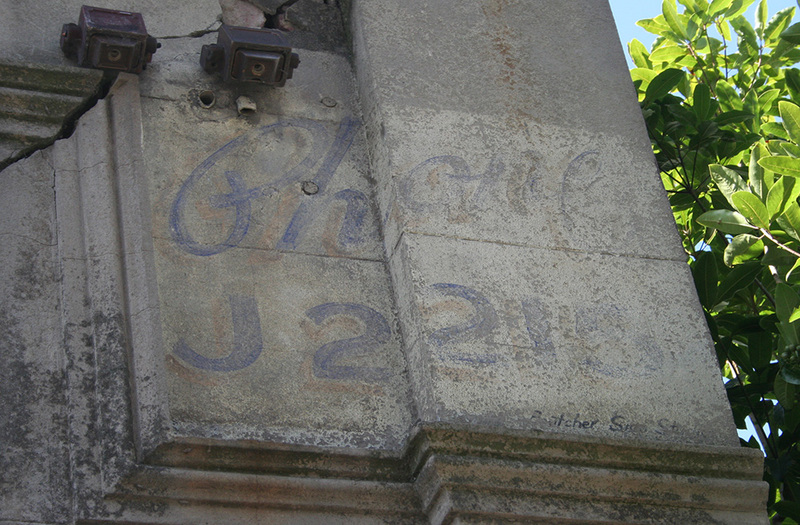 On either side is the word ‘Phone’ and the number J2215. This building has some interesting associations. It’s said that Richmond’s most famous gangster ran his illegal gambling operations around here in the 1920s. It’s the night of 27 October 1927, and he’s in the front seat of a taxi speeding through the Richmond streets. The cabbie’s driving as if the hounds of hell were after him and sweating like a pig – he knows who his passenger is, all right. Everyone knows Squizzy Taylor with his golden tooth and silver cane, his silk shirts and diamond tie pin, a souvenir of the Collins Street robbery. And everyone knows what happens to those who cross him – he scatters bodies behind him as casually as if he’s tossing aside his shirt at the end of the night. Bank managers, jewellers, commercial travellers, rival crims – it’s all one to Squizzy, they’re all the same in the democracy of death. The track, that’s where he started, fixing a race here, picking a pocket there. He’d been born into a respectable family, but a life of honest toil wasn’t for Squizzy. He looked up at the grand houses on the hill and thought, I’m good enough for that too. All it took was a bit of bravado, a dash of aplomb. Make the other fellow believe you will stop at nothing. He and another cove once hijacked a cab, planning to pick up a bank manager and rob him – they even had the grave ready to go. When the driver refused to go along with it Squizzy shot him to teach him a lesson. You won’t be a hero next time, champ, he said as he squeezed the trigger. He was nothing if not versatile: a fellow had to be, in those days. Cash, jewellery, extortion, girls. He and his missus had a nice little line in blackmail: they’d fasten on to some swell, set him up with a sweet young thing, then once she was undressed the sweet young thing’s ‘husband’ would burst in and demand revenge. The swell’d hand over his wallet there and then to avoid a beating and the scandal. Made Squizzy laugh, how easy it was to take their money: that’s why he made free with it himself. Easy get, easy go. They loved him, the poor of Richmond, for his style and devilry, the way he’d hand out tenners to local urchins for an errand or a bit of information. And how Squizzy taunted the police, jumping bail and sending letters – ‘I was disappointed, detective, you didn’t join me at the dance hall Saturday last’ – it was better than a serial. He always had friends ready and willing to hide him from the coppers: he lay doggo in hidey holes all over Richmond, had teams of cockatoos to raise the alarm, flitted like a dapper ghost through tunnels and laneways, slipped through their hands like soap. But two-up was the real game. Diggers back from the war couldn’t get enough of it. It baffled Squizzy to see grown men so worked up about a toss of a coin, but who was he to question it? The money poured in, it was like putting out a bucket in a deluge, all you had to do was pick it up. And when the coppers arrived at Goodwood Street with their whistles and their cars to arrest the players, in no time a mob materialised to boo and throw punches while Squizzy ducked off down one of his tunnels with the money. Good times. But it was never just about the money, not after a while. Getting the money was too easy, there was always more of it. What he wanted was respect, admiration, acclaim. To be top dog, that’s what he aspired to. That’s why he had to take on the Fitzroy gang. His boys and theirs did a job together, cleaned up a jeweller’s in Collins Street: then Squizzy dobbed them in just to show that he didn’t need them. After that, it was on: shootings, stabbings, razors: his own missus got shot in the head (she laughed it off, though: tough old bird that she is). The vendetta went on for years: so long that Squizzy started to think he was invincible. No one could touch him: not the courts, not the coppers, not the Fitzroy gang. All the people he shot, all the robberies he committed – nothing was ever pinned on him. A cove even shot him the day before he went on trial: he took one in the leg, went into court on crutches, got acquitted and walked out of court to the cheers of his supporters. The Argus, 28 October 1927. Source: Trove. When the Goodwood Street house was prepared for sale a couple of years ago, a tunnel was discovered in its cellar – apparently one of Squizzy’s escape routes. An interesting piece on Melbourne slum clearances by Sarah Matthews at the State Library of Victoria. Find out more about Richmond at the Richmond and Burnley Historical Society. Hey Nick, i reckon you’re starting to understand what these places were like. I can only relate to the late 1940 s onwards, Vale Squizzy, hale John West and the Doc from Raheen, same places different faces. Brilliant post Nick, it will all, one day, make fantastic reading in book form. Hi Nick, my ancestors hail from Richmond. My Great, Great Grand Father lived on the top of the hill behind St. Ignatius. In much later years my Nana lived on the flats in her own home in Mahoney St but was bought out by the Housing Commission to build those monstrosities. She then moved to Collingwood. Thank you for the kind words Helen, you are very welcome! I have been staying in the large building on the corner of Lennox Street and Rowena Parade, Richmond, which used to be a hotel (now an art gallery). Are you aware that Squizzy Taylor was connected with an illegal gambling circle, and brothel, in the building? Thanks Steve, I didn’t know that. Squizzy left his mark in many places, that’s for sure. Hi Nick…in the early 20s in Preston, my grandfather regularly had male friends around for card nights, prawns, much alcohol, smoke-filled room… As a little girl, my mother liked the kind gentleman, Uncle Arthur, who always talked to her & gave her a thrupence for herself – a fortune! Turns out he was Arthur Taylor, Squizzy’s respectable brother (hopefully).